Left: There are four main categories of social strategy, yet with over 20 subset objectives, which we’ll discuss at a high level. Organizations that focus on social technologies suffer from the symptom of ‘Fondling The Hammer‘ . 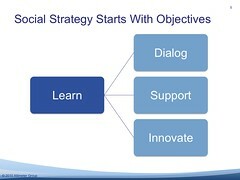 True social strategy stems from business objectives –not the latest technologies. So often, companies develop social tactics based on the latest tool that’s sprung forth. Yet, so far and few in between to organizations develop an actionable plan based on business goals. This second in our no-cost webinar series is coming up on the topic of social strategy. In the spirit of open research, we’re leading a discussion in public, and encourage you to join, learn, and share with others. Co-hosting with Charlene Li, we’ll be hosting a no-cost webinar to discussin how companies can develop a social marketing effort that meet business goals. Although not a requirement, our sessions build off each other, read, watch, and listen to our previously recorded session, we discussed how companies should really understand their customers before entering the social space. Please sign up, we’re only limited to 1000 attendees and last time we have over 800 signups. If you are unable to make the live webcast, we’ll post the full set of slides and recording on this blog and the Altimeter blog, so please subscribe. The hashtag for this event is #AltimeterWebinar, and if you’ve questions you want to pose in advance on Twitter, I’m listening and will factor in the top questions, or leave a comment below. Time to put the hammer down, and start focusing on building that house.